Estelle Fanta Swaray (born 18 January 1980) commonly known as Estelle, and formerly as Est'elle, is an English R&B singer-songwriter, rapper and record producer. In 2009, she won a Grammy Award for her song "American Boy" featuring Kanye West in the category Best Rap/Sung Collaboration as well receiving the MOBO for 'Best Newcomer' and received three consecutive 'Best Female Artist' trophies from the UK Hip hop Awards. Estelle was born 18th January 1980 in Hammersmith, London, England. 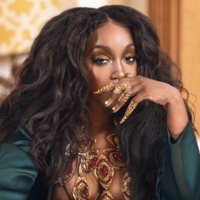 Born of a Senegalese mother and father from Grenada, Estelle grew up in West London in a large family of eight brothers and sisters and an extended family of cousins. During childbirth, Estelle’s mother had a near death experience, which influenced Estelle's choice for her first album title, The 18th Day. In 2004 she broke into the charts with "1980" and "Free" and won a MOBO Award for Best Newcomer. Both of the videos were directed by Andy Hylton and received much airplay on music channels. "Free" was written by Estelle and produced by Jimmy Hogarth. Her first album,The 18th Day charted at number 35 in the UK Albums Chart. Estelle teamed up with short lived pop band 3SL for their single "Touch Me Tease Me".